Lumley is an impressive-looking castle, built by Sir Ralph Lumley at the end of the 14th century. Built around a quadrangle with imposing towers at all four corners and a central gatehouse, it conjures up a most romantic image. Sir John Vanbrugh, the great architect of Blenheim Palace, remodelled much of the castle in the 1720s. 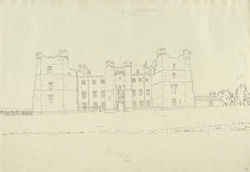 Grimm's sketch here shows the imposing gated front entrance, which Vanbrugh had reorientated away from the valley towards Chester-le-Street. The castle retains much of the characteristics from this time. It is now a hotel.